Flores used to be an isolated frontier, hiding the earth’s last remaining dragon and tropical gems from the rest of the world. Only the most rugged and adventurous could reach the hidden paradise. Today, the news has spread out and that sprinkle of tourist has beginning to change into a steady stream. Accommodation and facilities quickly follows the tourism trend. From what seems to be a humble fishing boat as the only means to marvel around the overtly gorgeous Komodo National Park, now the frontier is brimming with a lot of liveaboard options to cater all type of travel. From the low budget and joyful shared boat with only mattresses on the deck for sleeping, to the luxurious and private Komodo cruises Labuan Bajo, Flores has it all. If the former promise efficient and plain, straightforward journey, the latter offers richer sailing trip experience with add-ons facilities you’d love. One of the ultimate pleasure of travelling around Komodo with luxurious cruise is a chance to get an oceanfront cabin. 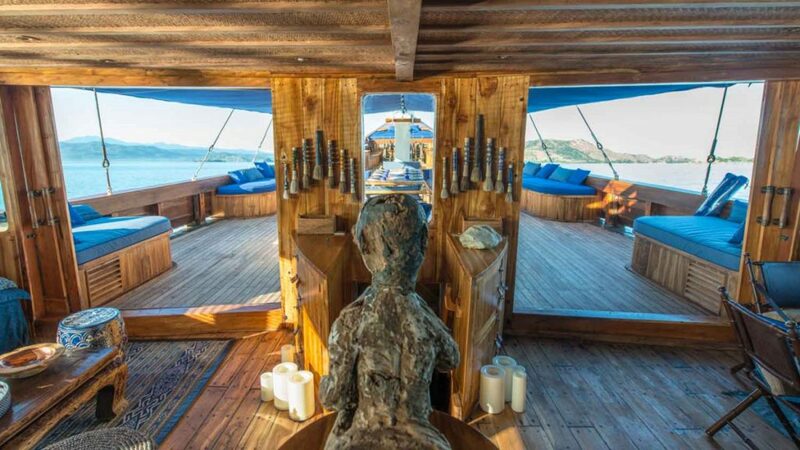 Now, not all cabins in cruises of Komodo were built in the main deck with private balcony and wraparound windows. Given the size (it’s quite smaller than usual cruisers), even the most luxurious liveaboard in Komodo can only offer one to three master, oceanfront cabins. The rest are located in the lower deck, though they are not in any way less fancy. Still, however, oceanfront cabin is the privilege of luxurious liveaboard that otherwise are hardly found in mid-range to lower budget liveaboard. Ah, the rooftop decks. The place where you can lie around in cushiony beanbags with cold drinks in hand. Where you can enjoy undisturbed scenery of Komodo’s hilly savannah and greenish blue ocean without any disturbance. It’s a perfect place to a moment get away from the crowd and just enjoy your holiday by yourself—or with your travel companion. While sundeck is not exclusive to luxurious Komodo cruises Labuan Bajo, it’s definitely more spacious and comfier. Most sundecks in established boats around Komodo is made for comfort with a pinch of style. It’s traveler’s favourite to linger around—especially after a hike or dive around the premises—and mingle with other passengers on board. Adventure doesn’t have to be rigorous and crude! You can have frontier exploration with creature comfort too, and it doesn’t violate any rules of travelling!